Candy managed to snag a room of her own in the house that the family is renting. She becomes convinced that the house next door, which has been abandoned for quite awhile, is haunted, and decides that she's going to solve the mystery that summer no matter what. Faustine is walking along the beach one morning when she happens upon some fishermen. She witnesses them catching and killing a fish, and is horrified by how inhumane the process is. Not only does Faustine stop eating and/or using any animal products at all, but she and Dinnie start picketing the fishermen. One of them gets so mad that he goes to the Rosso parents and complains. Just like in the last book, Hannah feels like the odd one out in her family. She wants to make the summer a little more interesting for herself, so she decides to play jokes on her family. At first, it's just little stuff, like replacing the sugar in the sugar bowl with salt, and short sheeting people's beds. Then Hannah gets serious. She does her best to make Candy think that there really IS a ghost next door, and she tells Justin that Abbie has a crush on him. This makes Mel (Justin's girlfriend) mad, which makes Lacey mad, which means that Abbie suddenly has no friends. She manages to straighten things out with them, and Hannah never confesses her role in that little situation. Finally, Hannah makes a friend her own age, and she doesn't have as much time to torment her family. Ira gets Lyme Disease. That's all. The Rossos have relatives staying with them for awhile, and Jan is feeling ignored. Not only is she not the baby in her own family anymore (that would be Keegan), but everyone is fussing over her little cousins. Jan wanders over to the set of the movie that Justin is filiming on Fire Island, and gets a full-on beauty treatment from the makeup person. She hurries back home, sure that her makeover will impress her family. When Jam gives herself one last look in the mirror, though, she decides she doesn't like her hair. So, she cuts it....right up to her ears. The family definitely notices that! Woody needs to make some extra money, so he makes little animals out of rocks and shells, and paints designs on other shells. He actually does pretty well for himself! All the Rosso kids are asked to be extras for Justin's movie. Dinnie has a hard time just staying in the background and not showing off for the camera, so she's given a small role as a dog-walker. Suddenly, she's sure she's going to be a famous actress someday. Bainbridge is looking after baby Keegan at Fire Island's craft fair when he spots a cute girl working at one of the booths. He's so busy flirting that he doesn't notice when Keegan goes missing. After a frantic search, he's found with Hannah, who gets a nice talking-to. The Rossos go home. Seriously....how much action did you think there'd be in a chapter that focuses on a freaking baby? Abbie's friend Lacey is blond, sophisticated, and from NYC. Now where have I heard that before? Speaking of, has anyone ever read Just a Summer Romance? Those fishermen were awfully patient with the twins. If some kid was picketing me like that, I would have gone to the parents first thing! I actually just read "Just A Summer Romance". I liked it. Had no clue that Anne continued on with those characters sort of "guesting" in this book. I've read Just a Summer Romance! That's one of those books I read way back when but only knew I'd read it later because of weird details (fudgy popcorn, anyone?) and I must've read it around the same time as this one. 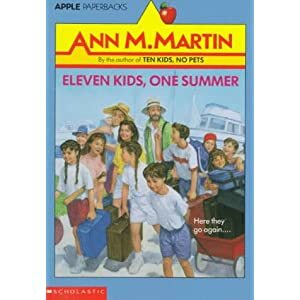 Not as good as Ten Kids No Pets but I do like this book. I'm sad you left out Ira eating ice cream for breakfast in the hospital. But that really isn't very interesting. Would you watch a reality show starring the Rossos?